What Makes a Diet ‘Heart-Healthy’? Could eating a certain diet help decrease your chances of having a heart attack? That’s a question a lot of people ask, especially if there is a history of heart disease in their family. Fortunately, the answer is yes. And that’s good news, especially when you consider that cardiovascular disease is the No. 1 killer of women, causing 1 in 3 deaths each year. 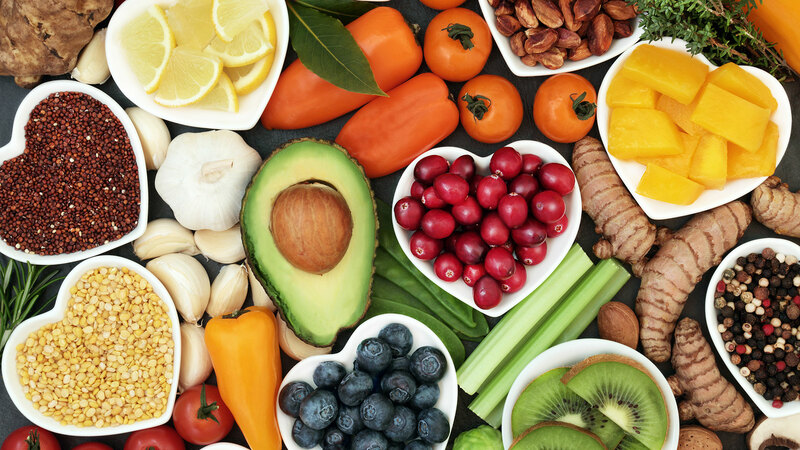 But having a heart-healthy diet is not just about eating healthy, Dr. David Greuner, a cardiovascular and thoracic surgeon tells SheKnows — it’s also about eating all the right foods to keep your heart functioning the way it’s supposed to. So, what exactly are the foods that make a diet heart-healthy? What should you eat to follow a heart-healthy diet? Even if your diet hasn’t been spot-on, making changes to your eating habits now can have a positive effect on your health. Consuming a diet full of fruits, vegetables, fish, whole grains, lean sources of protein and foods rich in fiber and omega-3 fatty acids provides a solid foundation for protecting your heart. Include these heart-healthy foods in your diet plan to keep your heart happy and healthy. Fish, such as salmon (wild, not farmed), tuna, sardines, anchovies and mackerel, are a rich source of omega-3s. “We know that omega-3-rich foods, EPA and DHA, can reduce inflammation and lower blood pressure,” Dr. Priya Khorana, who has a Ph.D. in nutrition education from Columbia University, tells SheKnows. Another source of omega-3s is alpha-Linolenic acid. Vegetable oils, nuts (walnuts and almonds), flaxseeds and flaxseed oils are rich in ALA.
Greuner says upping how often you have omega-3 fatty acids is crucial since this unsaturated fat can lower your triglyceride levels. Colorful, in-season berries are filled with heart-healthy phytonutrients and soluble fiber. Khorana recommends trying blueberries, strawberries, cranberries or raspberries over cereal or yogurt. If you want to start your morning with a heart-healthy meal, Khorana suggests plain, unprocessed oatmeal (steel-cut oats), which reduces cholesterol. You can add some berries and almonds for an even healthier breakfast. Bright-colored vegetable such as carrots, sweet potatoes, red peppers and acorn squash are packed with carotenoids, fiber and vitamins, all of which are heart-healthy according to Khorana. There’s a good reason avocados show up on many diets: They are loaded with monounsaturated fats, which can help reduce blood cholesterol and decrease hardening of the arteries. It looks like your mother was right when she told you to eat your asparagus. Khorana says this vegetable is heart-healthy because it is filled with nutrients such as beta-carotene, folate and fiber, which help protect your heart. Bright red tomatoes provide lycopene, vitamin C and beta-carotene, which help reduce your risk of heart disease. It looks like you’d better stop worrying about the fat content in a handful of nuts. Because eating a power-packed snack such as pistachios, walnuts and almonds, can provide you with good-for-your-heart fiber. They also contain vitamin E, which helps lower bad cholesterol. In order to have a heart-healthy diet, says Greuner, you need to be aware of what each food contains. That’s why he recommends avoiding foods high in cholesterol and saturated fat, like butter, yogurt or sausage/bacon. Other foods to reduce or eliminate from your heart-healthy diet include processed meats, highly refined (high-sugar) carbohydrates and sugary sodas. Greuner also suggests staying away from salt to keep sodium levels down. So, now that you know what to eat (and avoid), try to incorporate the heart-healthy foods into your diet as often as possible — as long as there’s something we can do to help reduce cardiovascular disease, we might as well do it.